is a unique eperience, imposing literally no limitations. Regardless if you are an artist using 3D printing to help you express your inner self, or an artist of 3D printing: an engineer, a designer, a maker, you need apowerful tool that is as transparent as possible. HotRod Henry’s speed and precision match the highest achievable in the market. The bundled software suite is among the most powerful out there. Combined with ease of use of the hardware itself, it will not leave you wondering about next steps. HotRod Henry’s large volume lets you print whatever you like. 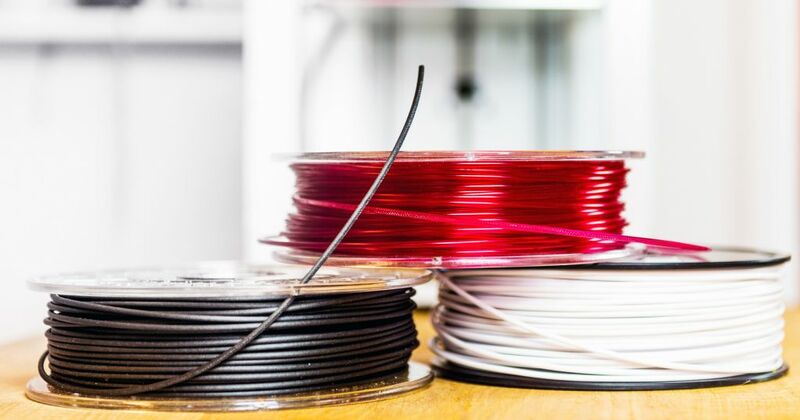 The material choice is always yours, as our 3D printer handles absolutely every filament money can buy. In the creative process, the ideas come into mind quickly. If you want to materialise your designs and visions, you need them right away. Henry Supercharged is 5x faster than a typical high quality printer*! We have teamed up with CreateitReal to supercharge the original HotRod Henry and build an ultimate speed deamon. HotRod Henry Supercharged is one of the fastest FFF printers. And if printing precision and material compatibility are part of the equation, it might actually be the fastest! 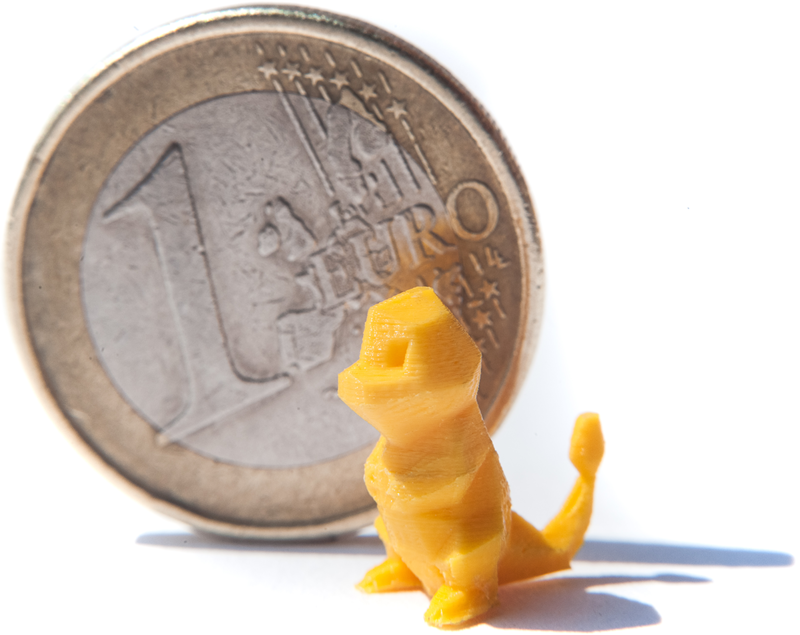 Thanks to advanced motion algorithms, you can benefit from printing speeds of up to 450mm/s. And we mean actual printing speed. Some manufacturers claim high printing speed coming from multiple heads, that print two, three or more little objects in parallel. That does not work with anything larger! Some claim that they achieve high movement rates based on just the motor feedrate limits they configured in their firmware. Typical electronic boards for robotics are great and we appreciate their flexibility. However, used in advanced 3D printers they are limited and must trade speed for accuracy or vice versa. Our mainboard is a dedicated solution for 3D printing only! And it simply delivers without any tradeoffs. But it is not only about the board. It is about mechanics as well. It has to run smoothly, while staying rigid and robust. Only then we can talk about high travel speeds of the print head. But there is more! To ACTUALLY PRINT fast you also need a state-of-the-art extruder. And it has to maintain constant temperature at high flows. Now that is a challenge! We spent hundreds of R&D hours to actually achieve the impossible. A direct-drive powerful all-metal extruder that supports every material, huge volume, and high speeds. And we can proudly say: We did it! *) With HS PLA and proper configuration you can go even faster! HotRod Henry Supercharged can achieve the highest levels of accuracy possible for a filament printer. Printing precision is always a combination of several factors. First, there is electronics and software that sets theoretical limits. Lots of manufacturers would actually base their precision figures solely on theoretical microstepping values of their motor drivers, do the simple maths and post it in their specifications sheet. But the reality is not as simple as that. In our physical world one has to consider the quality of mechanics, the material properties, and last but not least, the know-how of putting all of the above together. HotRod Henry Supercharged has powerful stepper drivers that allow 1/32 microstepping. But that would not mean anything without HotRod Henry’s CoreXY kinematics, ensuring low inertia and straight motion. What also makes Henry stand out in the industry is that all X, Y, and Z axes use industrial grade linear guides. The chassis and mechanical assembly are made of laser-cut aluminum components ensuring stiffness needed for accuracy. But what really lies beneath your HotRod’s power is its brains that control all that stuff. 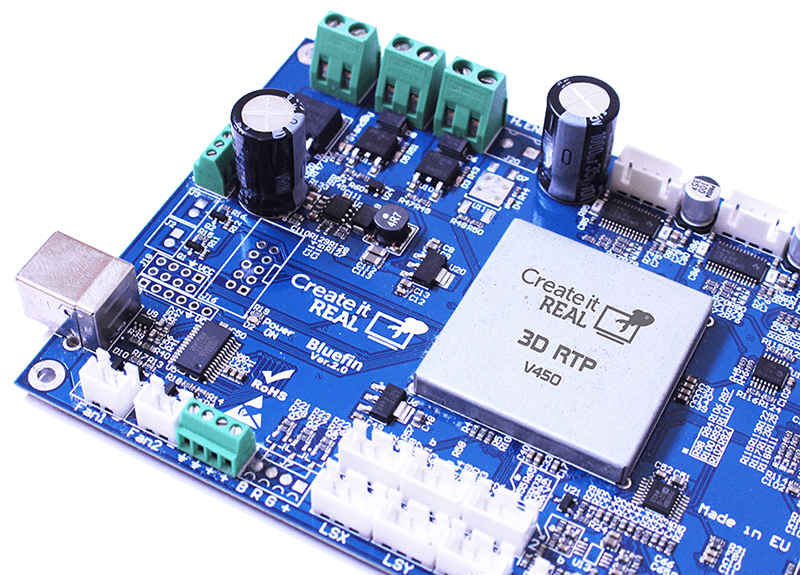 CreateitReal Bluefin electronics guarantees motion accuracy, and consistency that are crucial in converting virtual models into reality. It makes sure that the printing nozzle is always where it should, and that the amount of material being extruded is correct. With all the above in mind, we did not settle for theoretical figures (in our case 7 microns), but ran tests and measured our prints carefully. Now you can be sure, that an object printed with HotRod Henry Supercharged will differ from the original design by no more than 50 microns! Vertically, the bed could be positioned with accuracies below 1 micron! However, we figured that the best results are achievable using 50 micron layer heights for prints using a 0.35mm nozzle. Beyond this, the quality gain would be minimal if any. But you are welcome to test the limits if you like by choosing custom layer height. At the other side of the spectrum, e.g. using a custom 1.2mm nozzle can enable achieving layer heights of more than 1mm! 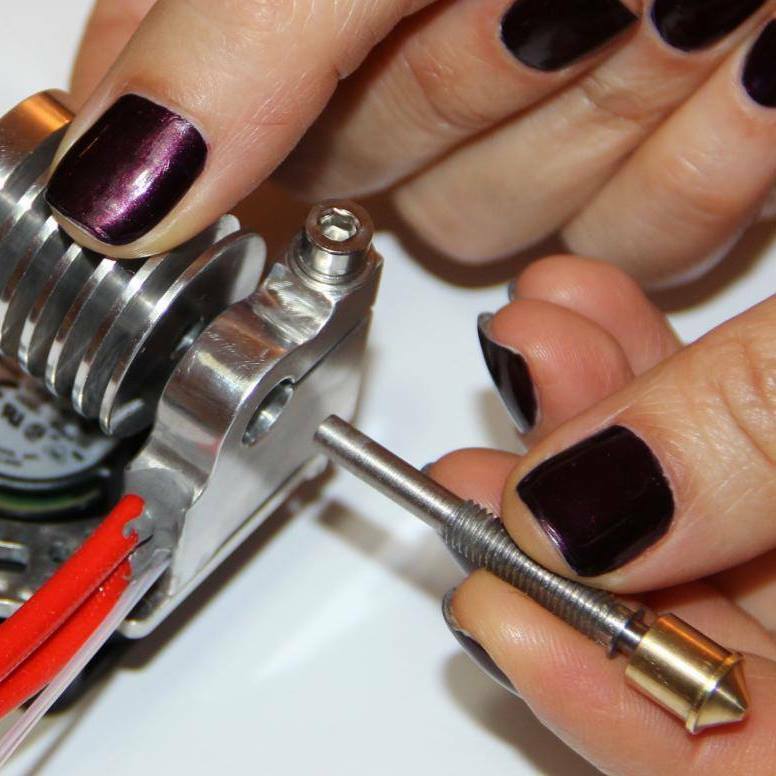 Our powerful hotend deals with that like a charm! You can stay calm and trust that those figures will stay constant in time. We have tested our prototypes extensively, running them 24/7 for months at various speeds and temperatures. We have not seen any signs of wear, mechanical play, or loss of accuracy. We are certain that you will not either! Print with anything you want – not with what you’re told to! Closed chamber and heated bed ensure that large ABS prints come out unwarped and strong. Powerful hot end lets you print fast with higher temperature materials. Direct-drive extruder enables flexible material usage. Stainless steel nozzles do not suffer extensive wear while printing glass or carbon fibers. But these are just a few highlights. Sophisticated printer deserves intuitive software suite! Our power comes equally from excellent hardware, great electronics, but also brilliant software. 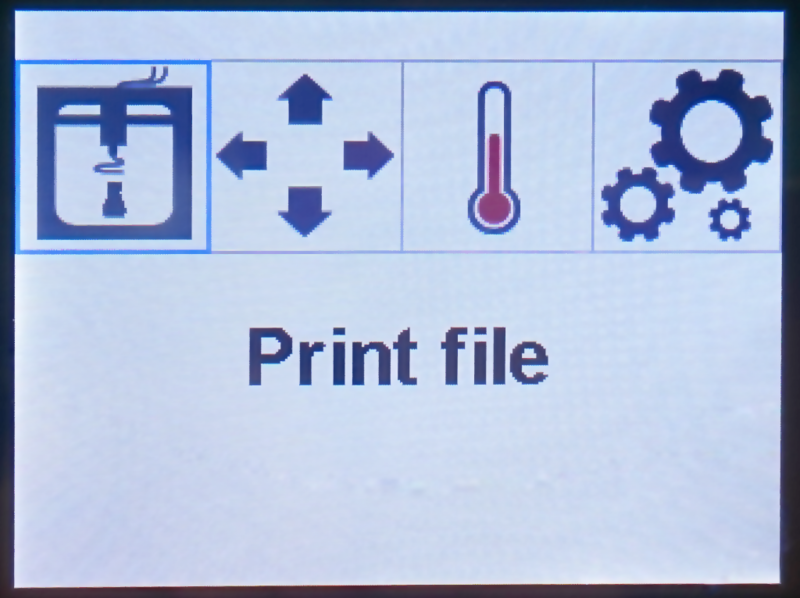 Even the best printer would not be able to print anything without a properly prepared code to run it. Therefore, every HotRod Henry comes with a licensed copy or RealVision software which serves both as a print preparation (slicing) software, and a host to control the printer if you choose to connect it to your PC. Quick and easy, but if you want it sophisticated – you will get it. Once you load your objects into the app, you can generate the code readable by HotRod Henry. To achieve this, you can actually switch on the fly between three levels of configurations complexity. The Basic Settings mode lets you control the essential parameters, such as object type, resolution, object strength, and temperature. The Advanced Settings mode gives you more control over speed, infill, extrusion, and first layers. The Expert Settings mode opens up a whole new world of possibilities with the most sophisticated fine-tuning options you could imagine. Regardless of the mode, every configuration option is explained in the right-hand panel. Therefore even if you get a bit confused by the possibilities, a quick glance at it will get you back on track and let you print your design exactly as you would like to. RealVision has a live-update feature and gets more and more features with every release. Searching for 3D content? Search no more! 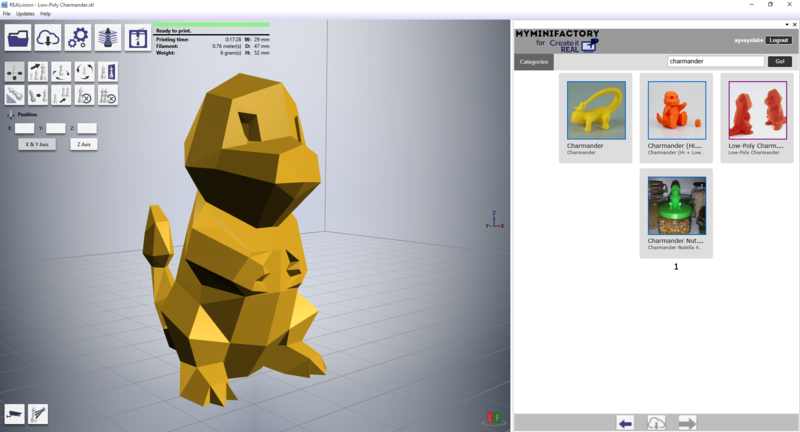 We have cooperated with one of the best 3D content providers out there: MyMiniFactory. 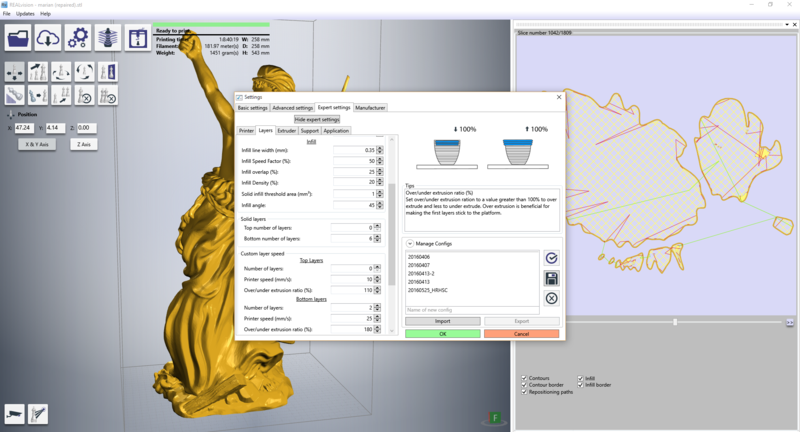 Model download functionality is actually integrated within RealVision. Just click the cloud icon, enter your login credentials for MyMiniFactory and you are free to browse and load objects directly onto your build platform! This is an excellent feature for first-time users, teachers or sales people for demonstration purposes. See your models in life size before you print! Another great feature built into RealVision is RealView. This is an augmented reality mode that allows you to live stream a video of your model in its actual dimensions. This not only is an eye catcher but also helps you determine whether your model is the correct size, and therefore saves your time and money which you would spend on actual print. Once set up, HotRod Henry is convenient to use. You get consistent results. Always. When working on HotRod Henry Supercharged, we focused on the User Experience part. Therefore we went further than the PC app to make it accessible. 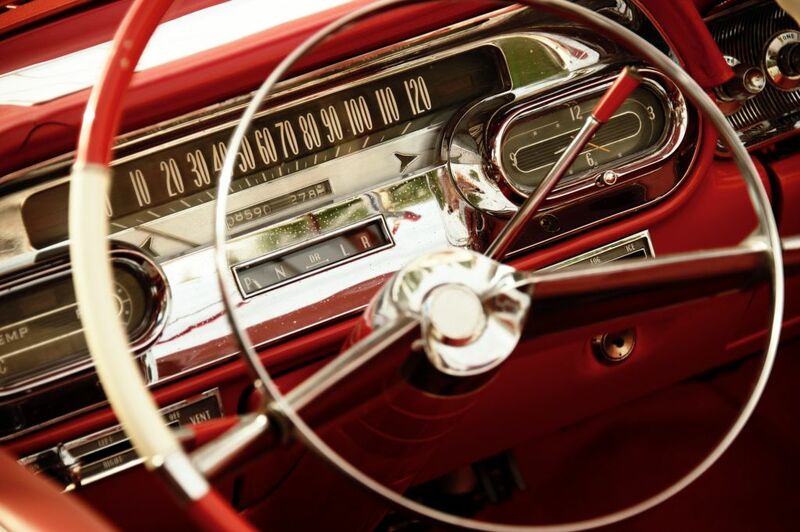 HotRod Henry got rid of unfriendly controls in favour of a modern TFT touchscreen. It does not need to be connected to a PC. Just plug a USB stick with the generated code and you are ready to go. Browsing the contents of your drive is easy and selecting a model is a couple of clicks away. If you wish to pre-heat your machine, you can easily do it from the user interface as well. It is also easy to calibrate the build platform. Just launch the calibration option, and an intuitive assistant will guide you through the whole process. Once done, there is no need to repeat it every time you print. Your HotRod will remain properly set up. We recommend launching the procedure when you change the build platform surface, or once you wish to print with layer heights lower than 100 micron for the first time. Changing nozzles has never been this easy. High Temperature Cobra Extruders are equipped with patent pending nozzle and guide exchange system that allows you to switch nozzles without the need for calibration afterwards. The whole process is also extremely easy and takes less than a minute. To learn more about the procedure, you can check this video.